Information stored in SplashID Safe can be imported into DataVault in several way. You must use the desktop versions to move the data however, free trial versions of DataVault for Mac and DataVault for Windows are available if all you want to do is import your data and sync it to a mobile device running DataVault. To move your data from SplashID for Mac to DataVault for Mac, following the instructions below. Start SplashID for Mac version 6. Select File > Set Password... then set the password to blank. Select File > Export > SplashID vID. Check off Export all records, uncheck Attachments. When prompted to set an optional password for the vID file, leave the fields blank and click Ok.
Make a note of the folder in which you save the vID file. Start DataVault for Mac version 4.4.15 or above. Select File > Import > SplashID. Go to folder in which you saved the SplashID vID file and select it. In DataVault, set field mappings as displayed in the screen shot below. After import is complete, click on the Types button and rename each type. SplashID stores a row of template information for each item. You can remove this information in two ways. Click on List View in the DataVault menu bar, then hold down the Command key, select items then click on Delete in the menu bar. 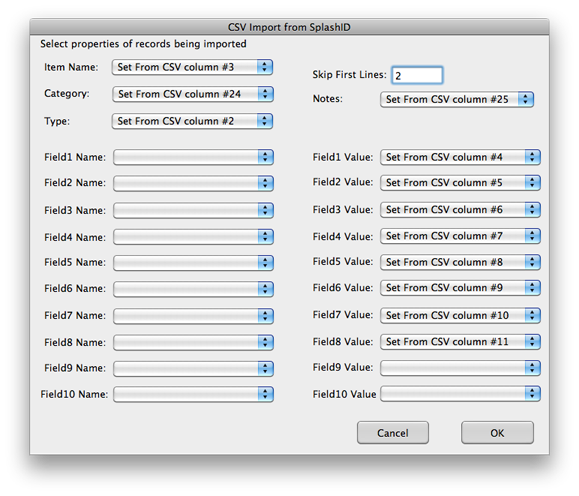 Open the SplashID vID file as a CSV file with a spreadsheet application, sort on the first column, then delete all rows with T in the first column.